This is something I am sure every Singaporean man who has served National Service knows. Due to camp confinement, a lot of people simply let go of their diets and stop training for 5 days, probably weekends too as we need to spend time with our loved ones. 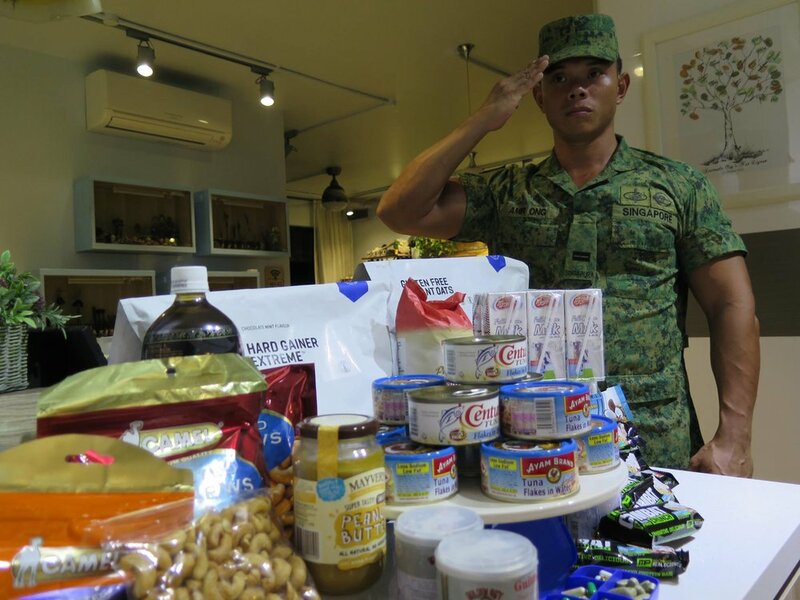 I just completed my 10-day 5th In-Camp Training (ICT) in Infantry Training Institute (ITI), Jurong Camp 2 and would like to share with you how I devised my training and stuck to my diet while in camp. Why Do I Bring Those Foods? The reason why I bring in canned tuna is because of the insufficient protein content and high amount of saturated fats in the provided army meals. One can of tuna gets me 26g of protein and I usually select only 'clean' types of meat (like? ), rice, lots of vegetables without any gravy for my lunch and dinner in the cookhouse. Cashew nuts, protein bars, rice cakes and peanut butter are my snacks. I usually bring them outfield. Milk is for my shakes to ramp up the calories if my calories are far too little for the day. Finally, protein powder for whenever I need a quick protein ingestion. How Do I Eat Canned Tuna? I usually open the lid and drain the existing water. Next, submerge with water at least 3x to remove the 'metallic' and 'pet food' smell. After that, I either eat it on its own or with a cookhouse meal. What Not To Eat In Camp? I avoided canteen food like fried fillet burgers, fries etc. However, good thing is- you can buy half boiled eggs from them which cost $0.60 each. Inside cook house, be selective on the food which is being served to you. Try to avoid gravy, fried chicken, fish, beef, and soup; Eat as clean and dry as possible. Don't succumb to the free flow of sweet drinks, ice cream, fruits. These are sugars which can easily make your body store fats rapidly due to the excessively high level of sugar. Do I Have Cheat Meal In Camp? Not at all. I keep my diet strict so that my weekends can be spent out with my wife. She deserves to be taken out for a good dinner or lunch. How Do I Eat Outfield? I know it is hard to eat outfield with all the 'camo' on etc. No choice, you just have to be strong and eat whatever you bring with you. Where Do I Train? There is only 1 gym in ITI and many would lament that it is extremely run-down and impossible to train. But you can make it work. How Do I Train With Such Gym Equipment? Thanks to all sorts of training styles and methods I learned over the years, I managed to improvise and devised a training plan for myself. You can use my plan (below) as a template and make it your own. I use this plan on Mon, Wed and Fri. Tues and Thurs will be my arms day and when I book out, Sat or Sun will be legs day. Compound sets, back-to-back exercises with minimum rest but maximum weight that you can handle for 10 reps x 3-4 sets. Always perform a few sets of pull-ups to warm up near the In-Pro center before you go to the gym. This is to warm up your scapula and back stabilizing muscles. Why Do I Train Upper Body So Many Times A Week? During this period of time, there is no way to build muscles. Hence, the only way is to 'maintain' and sustain whatever you could in camp. To be honest, it is difficult to train legs in that gym. I'm a strong believer of Squats. Henceforth, hitting the upper body more to maintain the existing mass. Train legs on a weekend then eat big and rest. What Time Do I Train? I usually train around 4.30pm or 5pm then at 6pm, I will go straight to the cookhouse for dinner. Of course, if you would like to train in the morning or any point of time in the day, go ahead. There is no rule / golden time as of when to train. It all depends on how you feel and how you prepare your mind for training. How Many Hours Do I Train In Camp? I never go beyond 1 hour while training in ITI gym. The weights are not heavy enough and hence, rest time ought to be shortened for maximum intensity. Any Other Advice? It’s just 5 or 10 days in camp so your muscles will not atrophy if you keep training. Stick to your diet and whenever you feel hungry, drink a 250ml cup of water and you will be fine. If you let loose and eat, you will indeed become fat. That happened to me a few years ago, which I regretted. I rather lose a little muscle mass then to gain unwanted fats. Take it easy, enjoy your staycation, chill and relax.